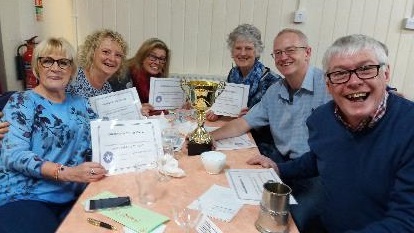 Seaton Sluice and Old Hartley Residents’ Association (in cooperation with the Community Association) held a Pie & Peas Quiz Night on Friday 15 March. The quiz night was well attended and we raised £405 that will be going towards equipment for the village In Bloom Group Volunteers. The winning team (pictured below) were presented with the Village Cup, prize money and the highly valued hand crafted winning team’s certificates. The night was a great success and a huge thanks to all involved.